The presence of viable GMO sugarbeet roots in recycled potting soil is the lead article in today’s Corvallis Gazette Times/Albany Democrat Herald. The beets were identified because they bore numbered tags. I’m not going to repeat or paraphrase this article which is an excellent example of hometown journalism and why we need our newspapers. When such a shocking and distressing development occurs a bright light needs to be shone with careful reporting. Here’s the link to this illuminating article: your comments and discussion are welcome. Cooked greens make a delicious salad base. This was an evening to find a purpose for accumulated ingredients. We had leftover multi-colored Swiss Chard which was braised in a little olive oil and garlic. The stems and garlic were cooked for three minutes before coarsely chopped leaves were added. Slice beets, orange and mango into a dish. Dress with vinegar and oil. Layer over greens, sprinkle first with parsley and then cheese. A few added walnuts would be good. 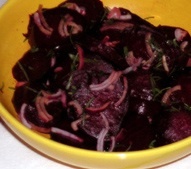 Another version for beet and salad would be sliced pears and a sprinkling of dried cranberries. Fresh tarragon would be a good herb along with parsley. Our Neon chard is large leaved and quite beautiful in mid spring. This is from last year’s planting and chard makes great regrowth once spring arrives. Chard belongs in every garden and is pretty enough to add to a flower bed. Leaf miner can be a problem in some areas and now is safely controlled by using organically approved spinosad applied as a light spray. We use and offer it as Monterey Garden Insect Garden Spray. Miners Lettuce, Claytonia perfoliata grows wild up and down the west coast. It’s a lovely little plant for spring salads and is easy to grow. Rich in vitamins A and C, it was an important food for Native Americans, early settlers and gold rush miners. A few seeds sown in bare spots will show up as clusters of rounded leaves with tiny white flowers in the center. Stems as well as leaves are edible. Best picked when budded or blooming and before seeds form. The flavor is freshly green and grassy and melds beautifully with other ingredients. A few years ago I was talking with Pam Peirce, author of Golden Gate Gardening, a year-round guide to food gardening in the Bay area. I asked if she liked mache/corn salad and she said “it’s ok, but I much prefer Miner’s lettuce”, so I began paying more attention to this garden green. Both now have an important space in my garden. With only a little encouragement both these plants will obligingly self sow. Serves 3-6 depending upon appetites. A generous serving is a light main course. To avoid tossing the delicate miner’s lettuce make this a layered salad. Spread out the greens on a serving dish and sprinkle with fresh spearmint. Combine beets, red onion, walnut oil, vinegar, salt & pepper. Spread beet mixture over the greens. Toast walnuts in a small skillet set on medium heat with oil and sugar. They’ll become fragrant and ready to use in 3-4 minutes, watch carefully as they can quickly go from perfect to scorched. Sprinkle cooled nuts over beets and last drizzle with cheese.